Madyan is an ideal place from where to start day-walks. Directly surrounded by mountains, it lies at the junction of the Lower Swat Valley, Chail Valley, Madyan Valley and the Upper Swat Valley. The way to Kalagai starts behind the Swat Holiday Hotel (the big building on the right). 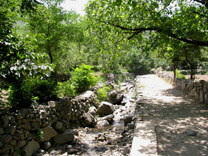 One of these day-walks brings you to Kalagai village, on the east side of the Swat River. From the bazaar, go north. The trek begins at the backside of the Swat Holiday Hotel - and leads up through Kalagai, Baranai straight up to the summit, giving you great views over whole Madyan. This walk takes about 3 hour. 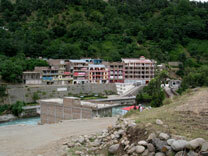 The village of Bahrain and the river Swat. A flatter walk brings you to Bahrain, along the Swat river. Starting in front of the Swat Holiday Hotel, going parallel to the road but on the opposite side of the river. The path goes through the friendly villages of Mankar and Hayin; there's a bridge linking both villages to the main road. When you reach Bahrain, you have to cross the wooden bridge to get into the bazaar. Below the bridge, the river is narrow and very strong, often with a bright blue colour which indicates that the water comes right from the glaciers of the Upper Swat. On the opposite side of the bridge there's a path on the adjacent hill. Some locals may try to show you the place and then ask for a bakshish, as they do with Pandjabi tourists, but you don't need any guide there. Bahrain is a great place to find handicrafts like shawls, pakols (wooden hats), colourful women clothes and fine pashmina. Jewellery and antiquities from Bahrain are famous in N.W.F.P. and all Pakistan. Ask Murad Ali from Madyan Guesthouse to get to know the realistic prices (go to the contactform). If you go with him to Bahrain, ask him to show you the old lassi-shop (near the bridge) where you can taste the best lassi and kir of Swat. This walk takes 2 hours for one way and is best done when the sunlight is weaker, in wintertime or in the afternoon. There are shared taxis between Madyan and Bahrain, at 10 to 15 Rupees per passenger. Another flat walk is up the south side of Madyan Khwar (the central river of the Chail Valley), past the fish hatchery on the road to Shankur (1½ hours). From here cross the river on one of the two bridges and carry on until the valley splits; the left trail goes up to Vershigram, 2½ hours from Madyan - here you'll find views of Mt. Piazo Bandeh (the 'uninhabited onion'). It's quiet safe to walk this far, but take a guide if you plan to go any further. Guides can be organised at Madyan Guesthouse. Buses from Madyan go as far as Shankur. 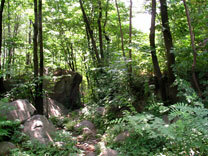 A trekking path through the forest. The trail starts in Teraat, south from Madyan, and is reachable by walk (45 minutes) or by shared taxis / pick up. You spend the night in Darra, a traditional village in the mountains. Delbar, son of Tohor Haji, can offer you a shelter in his house which has best views of the village. Next morning, go to Junusar (6-8 hours) where you see the whole valley of Madyan and Khwazakhela. It is possible to go back to Madyan the same way, or to continue westwards to Laalku. From there, you can do the 15km to Madyan by walk or by public transport. A 3-4 days trek leads in the direction of Besham, passing Shankur, going to a plateau where the Madyan Khwar (river) starts. It is possible to sleep there, on the shore of the Beshigram lake. From Madyan, it is a full day walk. 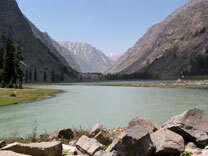 From Beshigram lake you can do one-day- or half-day-walks to explore the surrounding meadows. Murad Ali at Madyan Guesthouse can organise this trek, which is best done in July or August (go to the contactform). 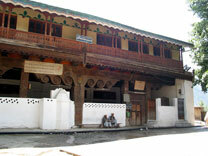 The old wooden mosque in Kalam. The way from Madyan to Kalam takes 2-3 days and leads on the right side of the Swat river, passing Bahrain, up the valley. There's also the possibility to do the journey by shared taxi or minicoach (2 hours). 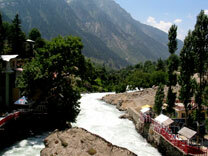 Kalam is a tiny and very touristy village, divided by the Swat river. On one side is the old part of the village, on the opposite side is a line of hotels and restaurants, where crowds of Pakistani tourists spend their holidays in summertime. The village has an old mosque (approx. 300 years old) with big wooden columns carved with Gandhara motives. 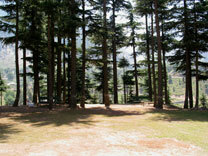 Behind the village starts the 'jungle', as the locals call this dense forest of deodar trees. The area around Kalam (including Ushu and Utrot Valleys) is one of the most heavily forested of Pakistan. A half-day walk leads south from the town, passed the big hotels and then right (west) up a jeep track into the dense forest. The road curves right and continues up to a ridge called 'hilltop', which offers great views on Mankial peak. From there it descends northwards, cross the Desan river next to a wooden mosque and then through the village of Jalban before reaching the PTDC motel; a total of three hours. The village of Ushu in Ushu valley. 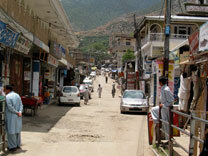 Another half-day walk leads to the village of Buyun, on the opposite side of the Swat river. Cross one of the two bridges from the bazaar to the old village, then go south (right) on the jeep track which after crossing a bridge ascends for 30-60 minutes. From Buyun village you'll have two possible ways to continue: Either go up to Jag Banal Meadows (1-2 hours), extensive pastures blessed with sprngs. Or find the road that leads above the last houses in the direction of Ushu valley. You pass through a forest of big deodar, pines, fears and Himalayan spruces, before the track meanders down to Kukunel village (1 hour), from which you follow the river to go back to Kalam (15-20 minutes). 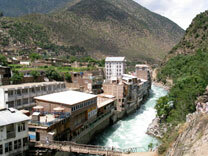 At Kalam, the Utrot river (from the northwest) and the Ushu river (from the northeast) join to form the Swat river. Both valleys are covered with forests, with villages and some waterfalls, and at the end there are glaciers and high peaks. View over the Mohedand Lake. By walk it is two hours (10 km) to go to Matiltan, passing through the 'jungle' on a road. You may also get a lift from other tourists by vehicle or hired jeep. After Matiltan the track leads further into Ushu Valley. Beyond this point it is highly recommened to take a guide (ask Murad at Madyan Guesthouse - go to the contactform). 25km from Matiltan village is the scenic Mohedand lake, with unobstracted view of Swat's highest peak Falaksair (5918m). The road is open from June (sometimes mid-may) to November, and Jeeps usually ask 1300 Rupees from Kalam, but it is an easy walk to Mohedand, along the bright blue river and passing small villages. From Kalam the trek takes 2-3 days depending on how fast you walk and how much you want to explore the area of Mohedand; there's another lake 4km after and several glaciers around. You need a guide and a tent; both available at Madyan Guesthouse. 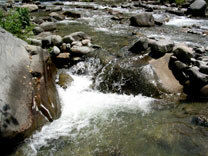 The Utrot valley is drier and less friendly but also offers walks and treks. Utrot village is 16km away from Kalam. Further away is the Utrot Khwar (river), where the Gabral Khwar enters from the west. There's Gabral village, located 8km from Utrot village. A jeep track leads there. The Swat river is populated by trouts. Swat is reputated for its trout fish. Best places to eat it is 'Trout Park Hotel' in Madyan or you choose your fishes in one of the several fish hatcheries, in which case they will be prepared in Madyan Guesthouse. Murad Ali can arrange a permit if you're interested to fish yourself in the Swat river (go to the contactform). All kind of coldrinks, biscuits, sweets and fruits. 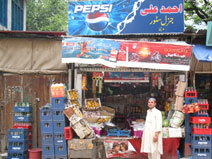 Main Bazaar Madyan, Swat, N.W.F.P., Pakistan.